Zipper (fastener) is small as YKK said”Little parts,Big difference”. 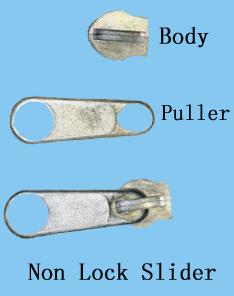 As accesories for zipper,Slider is more smaller,but the same not easy to produce and can make zipper in big difference.There are so many kinds zipper sliders,here introduce the machines to produce non lock zipper slider in zinc material(As Pic Shows). 1.Die casting machine(hot chamber), in different size: 12Ton, 18Ton(20Ton),25Ton,30Ton… Normally choose 12Ton and 18Ton for zinc slider body, puller,cap by changed mold. 2.Rolling and removing machine: take the slider body and puller after die casting. 3.Polishing machine: for high quality zipper slider, it is better to polish raw body and puller. 4.Drying and heating machine: drying body and puller after water polishing. 5.Non lock zipper slider assembly machine: semi-auto non lock zipper slider assembly machine, auto non lock zipper slider assembly machine, multi-functions non lock zipper slider machine for selecting. 6.Zipper slider color painting machine or electronplating machine or electronphoresis machine,that is depend on different required of zipper slider.